Sciatica is pain that runs along your leg and often accompanies low back pain. The sciatic nerve is a long, large nerve originating in the lower back from branches of nerves in the lower part of the spinal cord that exit through holes in the lower spinal bones and extending down the back into the pelvis, buttocks and hip, thigh and calf into the foot. When this nerve is trapped, inflamed or irritated, it can cause pain, numbness, weakness, or other symptoms in the lower back and down the leg. There are several possible causes of this condition which chiropractic care can address. A misaligned vertebra can cause inflammation of the joints, putting pressure on the nerve. Bulging and herniated discs, stenosis and muscle spasms can also cause pressure on the sciatic nerve. Sciatica can also result from a sudden injury. For example, if a buttocks muscle is injured from running too hard or lifting too many weights as in piriformis syndrome, it may swell or tighten and put pressure on the sciatic nerve causing pain. Sciatica causes pain anywhere along the route that the sciatic nerve travels (your buttocks, the back of your thigh, the back of your calf, and even your foot). The sensation may be only a slight tingling or dull ache or it may be severe enough to decrease your ability to move. 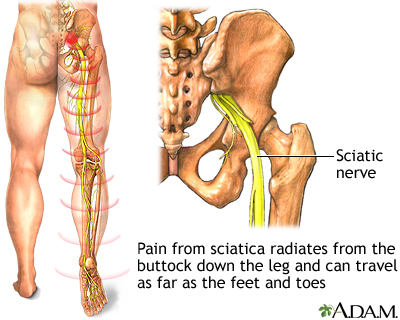 Sciatica almost always affects one leg or the other. Sometimes, however, you may have symptoms in both legs as in spinal stenosis. Piriformis Syndrome is another condition in which the piriformis muscle irritates the sciatic nerve, causing pain in the buttocks and referring pain along the course of the sciatic nerve. This referred, "sciatic pain" often goes down the back of the thigh and/or into the lower back. Patients generally complain of pain deep in the buttocks, which is made worse by sitting, climbing stairs, or performing squats. A pinched nerve is just that. A pinched nerve occurs when too much pressure is applied to a nerve by surrounding tissues - such as misaligned verterbral bones, cartilage, muscles or tendons. When nerves get pinched they become severely inflamed and muscles may spasm, causing even more discomfort. This pressure disrupts the nerve's function, causing pain, tingling, numbness or weakness. The pain is usually so severe that you can't move that part of the body and it can cause other symptoms as well. Since a pinched nerve can occur anywhere in your body it's common in the spine, but not limited to that location. A herniated disk in your lower back, as mentioned above, may put pressure on a nerve root, causing pain that radiates down the back of your leg (sciatica). Likewise, a pinched nerve in your wrist can lead to pain and numbness in your hand and fingers (carpal tunnel syndrome). Sometimes rest, massage, or even medication is helpful, but other times conservative chiropractic treatments are necessary for most people to recover from the effects of a pinched nerve. When you have chronic or recurring pinched nerves, this may be a sign of a condition requiring more appropriate evaluation. Sometimes, injections or surgery should even be considered to relieve a pinched nerve that is not responsive to conservative treatments.